Mary joined The OU in 2002 and became Vice-Chancellor in April 2018. 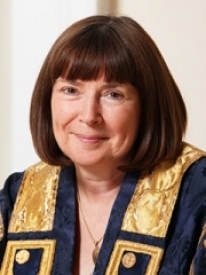 As Vice-Chancellor, Mary is the chief academic and administrative officer of the University, responsible for providing strategic leadership through her senior executive team, championing the interests of the institution at the highest levels with government, policy makers and funders, and ensuring the long term financial and operational sustainability of the OU. A Professor of Education and Childhood, she has held a number of senior leadership roles in the university including, Executive Dean of the Faculty of Wellbeing, Education and Language Studies, Interim Executive Dean of the Faculty of Business and Law and Dean of the Faculty of Education and Language Studies. Mary has over 35 years’ experience in the fields of education, childhood and youth. Before entering academia, she had two periods of professional practive in social work and teaching. She holds a number of Adjunct Professorships, is an Honorary Fellow at University at University of Central Lancashire, sits on several international advisory panels and was the Founding Director (2004) of The Children’s Research Centre at The Open Unviersity in 2004. She has authored on a wide range of education and childhood and youth related subjects, most notably on voice, participation, rights and empowerment issues.